Buffy reboot. Words fail me. I've finally added a new page to Imaginary Cinema - DVD reviews. It features some of the best fantasy movies available on DVD. Look for more updates soon! Are you out of your Vulcan mind!? I watched some of Star Trek on Thursday at work while I was waiting for costumed Trekkies to appear in the lobby (none did). It was really good. 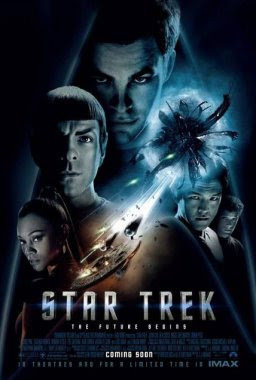 The best Trek movie since Wrath of Khan and the funniest since The Voyage Home. It hooked me right from the star with the exciting and emotional birth of James T. Kirk. Both Kirk and Spock are developed well from childhood, but most of the other characters are given short shrift, despite good performances (especially from Karl Urban as Bones). Simon Pegg is fine as Scotty (despite not being Scottish!) and it’s great to see Leonard Nimoy, of course. Winona Ryder, on the other hand, is fairly wasted as Spock’s mum and Nero, while plenty evil, lacks the charisma of the villainous Khan. There was lots of action and laughs and a pretty good story, though it jumps through lots of time travel loops to set this in an alternate history so as not to upset the old school Trekkies. Aside from some minor quibbles though (why are the space scenes silent only half the time?) this is a big daft visually stunning slice of entertainment. Roll on the sequel!